Over the years, Dougal Keane developed a personal rule: Never adventure with people you like. If pressed, he might modify it to: Don’t adventure with people you’d hate to see die. Now, in the depths of the crypts beneath Divinity’s Reach, he was getting his wish. Dougal disliked his comrades intensely. He also hated his task. Most of all, at the moment, he hated the stifling heat of the crypts themselves. The sweltering summer heat that enveloped Divinity’s Reach above had stolen deep into the bowels of these hidden burial grounds, where it festered like a hidden wound. The prevailing winds that caressed the burial ground’s cliffside entrances might carry the stench of the warm, dry rot away from the city, but inside the crypt’s twisting passages, Dougal had no means of escaping it. People had been bringing their dead here since before the founding of Kryta’s new capital, and Dougal swore he could smell the dust of every last one of them. Their explorations had taken them into parts of the crypts that even Dougal was unaware existed. At each branching of the path, Clagg had consulted his glowing map, then indicated they take the less-traveled option. The smooth, polished flagstones of the Skull Gate in Divinity’s Reach gave way to less-used paths, and finally to rooms and corridors that had been untouched since the dead were left here to desiccate centuries before the founding of the city above. Still, as he stalked forward, brittle skull fragments of all shapes and sizes crunching beneath his feet, Dougal reminded himself that these crypts weren’t as bad as some places he had been. The ruined temples of the Caledon Forest, or the Bloodtide Coast, its beaches awash with twitching, malevolent corpses. 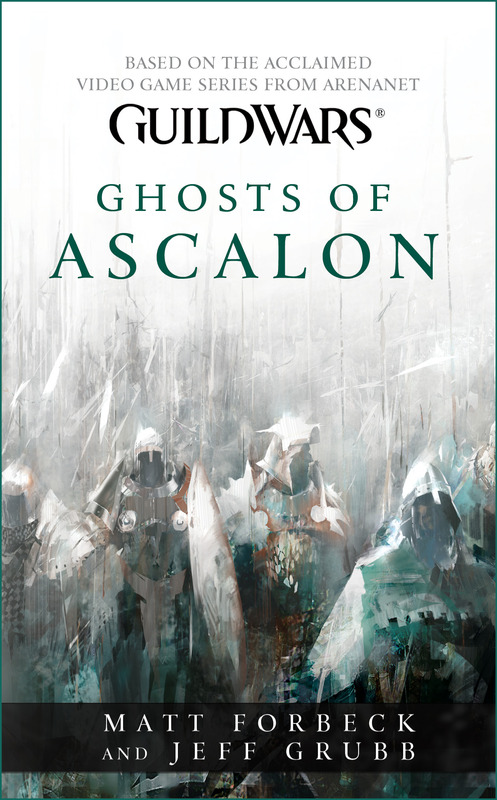 Or Ascalon. Never as bad as Ascalon. Dougal stopped and rubbed the stubble on his chin as he scanned the bone-covered passage before him. It opened into a wide chamber that stretched far beyond the reach of his torch’s light. It was clear of bones. He signaled for a stop, and his companions—the sylvari, the norn, and the asura riding his golem, the one who’d hired the rest of them for this expedition—pulled up short behind him. “What is it?” snarled Clagg. The asura was irritable when they first met, and the closed, stuffy air of the tomb had done nothing to improve his disposition. Clagg’s people had bubbled up from the depths of the world over two centuries ago, harbingers of the fact that the nature of Tyria was about to change. They were a small people with oversized, flat-faced, ellipsoid heads, the width of which were made more pronounced by long ears, drooping in Clagg’s case. Their skin came in varying shades of gray, their large eyes a product of lives spent in magic-lit caves. The asura arrived on the surface world not so much as refugees as settlers confident in their intellectual and magical superiority over every race they encountered. And, Dougal had to admit to himself, they were often right in that assumption. Clagg was seated comfortably in a harness fixed to the front of his golem, the creature a masterpiece of polished and painted stone and fitted bands of bronze. Its articulated limbs hinged on glowing blue magical jewels that held the independent parts of the angular, headless creature together without actually touching them. Magical force, magic beyond that which Dougal was comfortable with, held the creature together. A single large crystal housed between its carved shoulders served as both its eyes and ears. The sharp-faceted gem constantly swiveled around in its socket, scouring its environment for more input. Clagg called it Breaker, and seemed more concerned about its well-being than that of the other members of the party. “I said, ‘What is it?’ ” snarled the asura, its shark-like teeth flashing with irritation. Dougal rarely saw an asura smile, and was never reassured when he did. “Something’s wrong,” Dougal said, keeping his voice low. “Humans,” Gyda Oddsdottir muttered, shaking her head. The silver sleigh bells woven into her long, yellow warrior’s braid jangling loudly. “Always taking stock instead of taking action.” She set her huge hammer before her with a resounding thud, crushing a dry skull to dust. Dougal winced, not at the norn’s words, but at the racket she made. At nine feet tall and bristling with weapons, she thundered down the halls, making more noise than the asura’s golem. This daughter of the distant snowcapped Shiverpeaks didn’t care who heard her coming: she wanted to warn them of her approach. In the heat of the depths of the crypt, her heavily tattooed flesh dripped with a sheen of sweat. Gyda’s grandsires were refugees as well, fleeing from the power of one of the great Elder Dragons to the north. The norn were a healthy, hearty, proud people, quick to anger and equally quick to forgive. In his time since leaving Ebonhawke, Dougal had met good norn and bad norn. The good ones treated every day as an adventure, every problem as a challenge, and every foe as a chance for personal glory. Most people didn’t understand how dangerous the dark places of the world could be; the norn actually relished exploring them. Gyda, though, was definitely in the latter category of norn: boastful, judgmental, and unpleasant to those around her. She was both bullying and insulting, as if any achievement by others diminished her own. Dougal didn’t like it when she smiled, either. “And that means a trap,” said Killeen, the last member of the party, the sylvari, in her soft, melodious voice. Dougal nodded. The sylvari necromancer was probably the most pleasant individual of their motley krewe, himself included. Shorter than a human but not as diminutive as the asura, her skin was a verdant green, her hair more similar to the leaves of a succulent plant than that of a human woman. When she moved, golden pollen drifted off her. The humanoid appearance, Dougal knew, was a lie. Killeen and the others of her race were born fully formed from the fruit of a great white-barked tree far to the south. There was no animal warmth to her flesh. The sylvari were a recent addition to the world, their entire race only a little older than Dougal himself, but they had already spread far and wide, like an invading weed. Killeen had all the traits attributed to her race: she was honest, direct, and focused. In many ways she was better than most humans he knew. That may have been what made Dougal most uncomfortable of all. “What is it?” Dougal hated asking the question. He knew the asura was fishing for yet another reason to explain how brilliant he was. To an asura, the other races of the world existed primarily for heavy lifting, taking risks, and asking stupid questions. Gyda harrumphed as if no explosives could slow her down, magical or otherwise. Still, Dougal noticed, the norn’s feet stayed rooted where they were. From any of the others, such a statement would have come laden with sarcasm and bile. The sylvari, though, meant every word in earnest. It was, indeed, why he was part of this expedition: his knowledge. Of traps. Of history. Of the way the world used to be. “He hired me for my experience in recovering powerful artifacts,” said Dougal. Dougal ignored her. “Does anyone have something helpful to add?” Dougal asked. Dougal reached down and picked up a skull, trying not to think about if this was an ancestor. He aimed for a spot about in the middle of the room and touched the locket beneath his shirt for luck. Then he pitched the skull underhand into the room. Nothing. He pitched another skull to a different area. Nothing again. He pitched a third. Gyda rolled her eyes at his uselessness and folded her thick arms with impatience. Clagg shook his head at him as if Dougal were an addled child. “Not set off by noise,” said Dougal. “Not vibration or motion, either. That leaves weight. We should send in something heavy.” He looked at Gyda. “I will not be an experiment for you,” said the norn quietly, her face clouded. “Well, then, the golem,” said Dougal. “You care more for that walking statue than you do for the rest of us,” said Gyda. The sylvari set her chin and concentrated on a patch of the bones lining the left side of the passage. She swung her arms and fingers in a complex pattern and spoke words that made Dougal’s head ache slightly. A greenish glow formed in the wall of bones and coalesced around a human-sized set of remains. As Dougal watched, the bones detached from the surrounding patch and assembled themselves into a coherent skeleton. The deep-green glow, rather than sinew and tendons, held it together. The right side of its skull had been bashed in, and its jaw was missing, as was the lower part of its right arm, which terminated in a pair of jagged breaks. It stood before them like a servant presenting itself to its betters. Dougal shuddered as Killeen gave the creature a satisfied smile. She gestured again, and the skeleton tottered around and stumbled off down the passage toward the room beyond. The explosion cut him off. The animated skeleton disappeared in a cloud of flame and smoke. Dougal ducked down and wrapped his arms over his head as a cascade of bone fragments rained down on him, bouncing and clattering on the floor. One flying shard of their animated helper shot into Dougal’s heavy leather shirt and stuck there like a revenant’s fang. “Of course not,” Dougal said, feeling bad for upbraiding her. Despite himself, he couldn’t help but enjoy her sincerity. He followed the norn as she strode through the exploded room and into the chambers beyond. He’d worked with other norn before. They were larger than life in many ways, but norn bullies were just like everyone else’s. Gyda’s bluster was meant to cover some other deficiency. Dougal didn’t mention the norn’s own reluctance to enter the trapped room, despite her bragging. “Bah. Such a life only seems longer, like a tasteless meal,” concluded Gyda. As Dougal followed her, he noticed that the air had grown slightly cooler. Once they were all inside the next chamber, both he and the norn held their torches aloft. The light found something thick and gray hanging among the bones at the apex of the room’s high-arched ceiling. Dougal held up a hand to shade his eyes against the torch and peered at the substance. At first he thought it hanging moss, but suddenly it was clear what it was. Dougal cursed. He shouted out a warning, but Killeen’s high-pitched scream behind him cut him off. He spun about just in time to see the sylvari disappear into a hole in the ground.